For Women’s History Month, NASA and the International Space Station celebrate the women who conduct science aboard the orbiting lab. 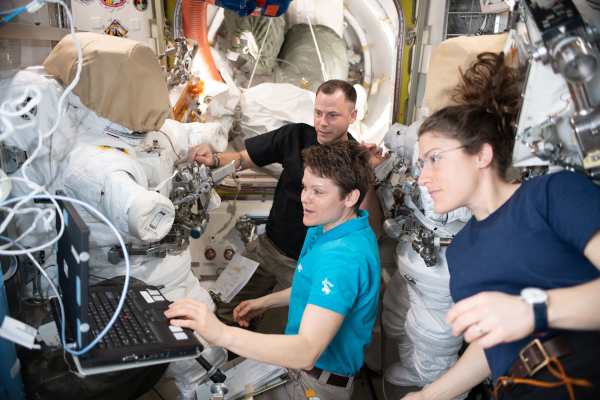 As of March 2019, 63 women have flown in space, including cosmonauts, astronauts, payload specialists, and space station participants. The first woman in space was Russian cosmonaut Valentina Tereshkova, who flew on Vostok 6 on June 16, 1963. The first American woman in space, Sally Ride, flew aboard the space shuttle mission STS-7 in June of 1983. Roscosmos cosmonaut Svetlana Savitskaya, the first woman to participate in a spacewalk, on July 25, 1984. NASA astronaut Susan Helms, the first female crew member aboard the space station, a member of Expedition 2, from March to August 2001. NASA astronaut Peggy Whitson, the first female station commander, April 2008, during a six-month tour of duty on Expedition 16. The most women in space at one time (four) happened in 2010, when Space Shuttle Discovery visited the space station for the STS-131 mission. Discovery’s crew of seven included NASA astronauts Dorothy Metcalf-Lindenburger and Stephanie Wilson and Japan Aerospace Exploration Agency (JAXA) astronaut Naoko Yamazaki. The space station crew of six included NASA astronaut Tracy Caldwell Dyson. Susan Helms shares the record for longest single spacewalk, totaling 8 hours 56 minutes, with fellow NASA astronaut Jim Voss. Expedition 24 marked the first with two women, NASA astronauts Shannon Walker and Tracy Caldwell Dyson, assigned to a space station mission from April to September 2010. The 2013 astronaut class is the first with equal numbers of women and men. NASA astronaut Anne McClain became the first woman to live aboard the space station as part of two different crews with other women: Serena Auñón-Chancellor in December 2018, and currently in orbit with Christina Koch. Christina Koch became the most recent woman in space, launching to the space station in mid-March to take part in some 250 research investigations and technology demonstrations. She earned bachelor’s degrees in electrical engineering and physics and a master’s degree in electrical engineering from North Carolina State University in Raleigh, and worked at NASA’s Goddard Space Flight Center’s Laboratory for High Energy Astrophysics, contributing to scientific instruments on several missions studying cosmology and astrophysics. Koch served as station chief of the American Samoa Observatory and has contributed to the development of instruments used to study radiation particles for the Juno mission and the Van Allen Probe. 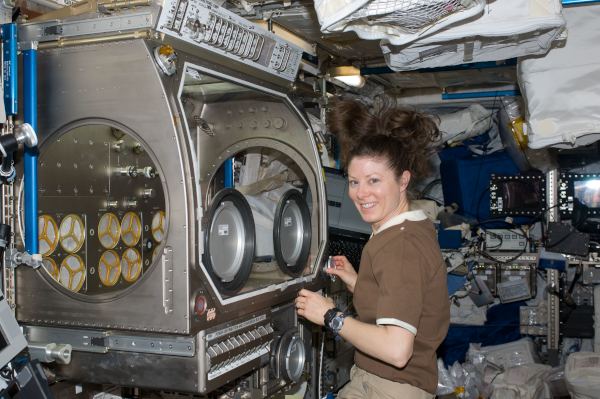 Flight Engineer Anne McClain collects samples for Marrow, a long-term investigation into the negative effects of microgravity on the bone marrow and blood cells it produces. The investigation may lead to development of strategies to help prevent these effects in future space explorers, as well as people on Earth who experience prolonged bed rest. A native of Spokane, Washington, McClain earned master’s degrees in aerospace engineering and international relations. She holds the rank of Lieutenant Colonel as an Army aviator, with more than 2,000 flight hours in 20 different aircraft. Serena Auñón-Chancellor conducts research operations for the AngieX Cancer Therapy inside the Microgravity Science Glovebox (MSG). This research may facilitate a cost-effective drug testing method and help develop safer and more effective vascular-targeted treatments. As a NASA flight surgeon, Auñón-Chancellor spent more than nine months in Russia supporting medical operations for International Space Station crew members. She has a degree in electrical engineering from The George Washington University, Washington, D.C., and a doctorate of medicine from The University of Texas - Health Science Center at Houston and is board certified in Internal and Aerospace Medicine. Astronaut Peggy Whitson holds numerous spaceflight records, including the U.S. record for cumulative time in space – 665 days – and the longest time for a woman in space during a single mission, 289 days. She has tied the record for the most spacewalks for any U.S. astronaut and holds the record for the most spacewalk time for female space travelers. She also served as the first science officer aboard the space station, the first female commander of the space station and the first woman to be station commander on two different missions. During her time on Earth, she also is the only woman to serve as chief of the Astronaut Office. Whitson earned a bachelor of science in biology/chemistry from Iowa Wesleyan College and a doctorate in biochemistry from Rice University. 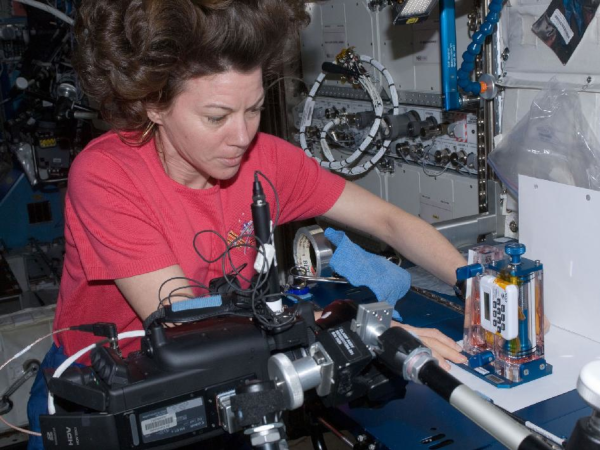 Here she works on the Genes in Space-3 experiment, which completed the first-ever sample-to-sequence process entirely aboard the International Space Station. This innovation makes it possible to identify microbes in real time without having to send samples back to Earth, a revolutionary step for microbiology and space exploration. 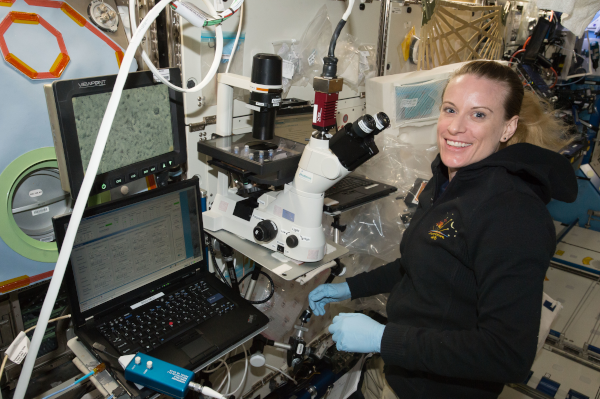 The Heart Cells investigation studies the human heart, specifically how heart muscle tissue contracts, grows and changes its gene expression in microgravity and how those changes vary between subjects. In this image, NASA astronaut Kate Rubins conducts experiment operations in the U.S. National Laboratory. Rubins also successfully sequenced DNA in microgravity for the first time as part of the Biomolecule Sequencer experiment. She received a degree in molecular biology from the University of California, San Diego, and a doctorate in cancer biology from Stanford University Medical School, then headed a research lab studying viral diseases in Africa, traveling there to conduct research and supervise study sites. 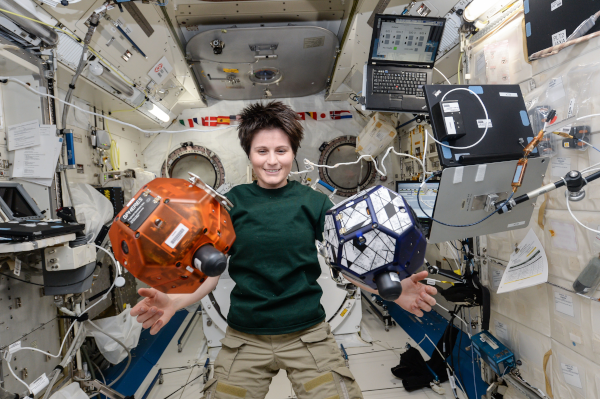 The first Italian woman in space, European Space Agency (ESA) astronaut Samantha Cristoforetti, conducts the SPHERES-Vertigo investigation in the Japanese Experiment Module (JEM). The investigation uses free-flying satellites to demonstrate and test technologies for visual inspection and navigation in a complex environment. Cristoforetti holds a master’s degree in mechanical engineering from the Technische Universität, Munich, Germany, writing her thesis on solid rocket propellants during a 10-month research stay at the Mendeleev University of Chemical Technology in Moscow, Russia. She also completed a bachelor’s degree in aeronautical sciences at the University of Naples Federico II, Italy. 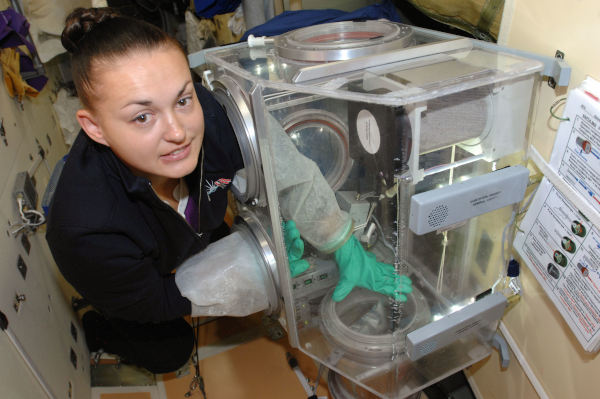 Cosmonaut Elena Serova, the first Russian woman to visit the space station, works with the bioscience experiment ASEPTIC in the Russian Glavboks (Glovebox). 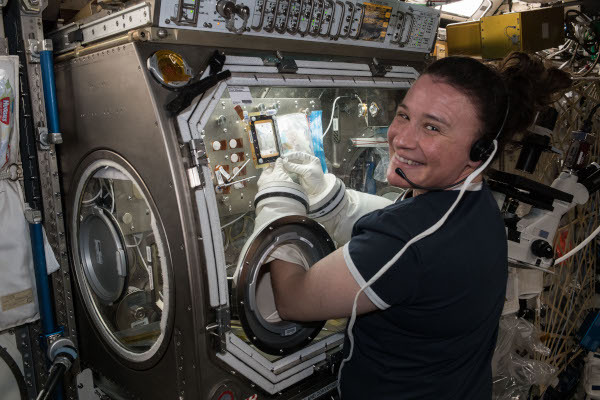 The investigation assessed the reliability and efficiency of methods and equipment for assuring aseptic or sterile conditions for biological investigations performed on the space station. She graduated from the aerospace department of the Moscow Aviation Institute as a test engineer, Moscow State Academy of Instrument-Making and information as an economist, and completed a postgraduate course at the Energia Rocket Space Corporation. 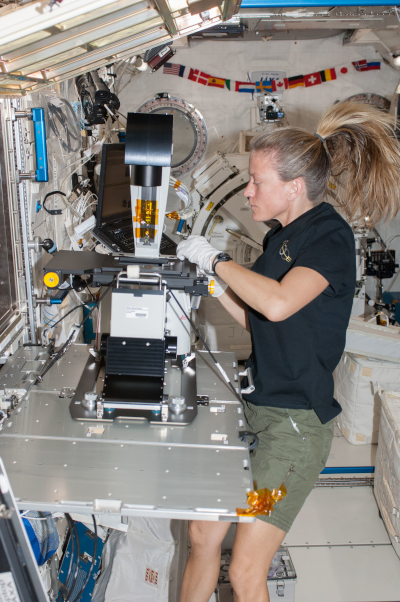 NASA astronaut Karen Nyberg sets up the Multi-Purpose Small Payload Rack (MSPR) fluorescence microscope in the space station’s Kibo laboratory. The MSPR has two workspaces and a table used for a wide variety of microgravity science investigations and educational activities. The Minnesota native earned a bachelor’s degree in mechanical engineering from the University of North Dakota and a master of science and doctorate in mechanical engineering from the University of Texas at Austin. Her graduate research investigated human thermoregulation and experimental metabolic testing and control, specifically related to the thermal control in spacesuits. 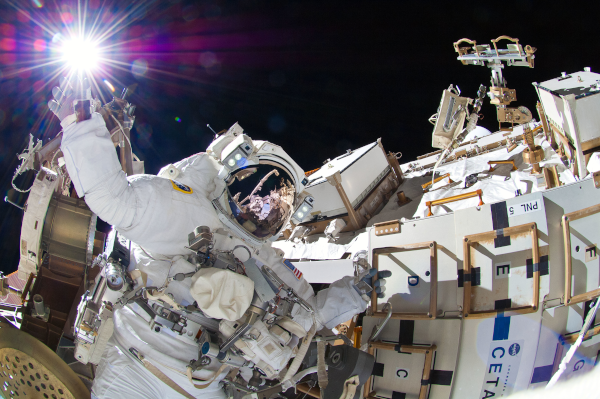 This spacewalk by NASA astronaut Sunita Williams and Japan Aerospace Exploration Agency (JAXA) astronaut Aki Hoshide, reflected in Williams’ helmet visor, lasted six hours and 28 minutes. They completed installation of a main bus switching unit (MBSU) and installed a camera on the International Space Station’s robotic Canadarm2. Williams participated in seven spacewalks and was the second woman ever to be commander of the space station. She also is the only person ever to have run a marathon while in space. She flew in both the space shuttle and Soyuz, and her next assignment is to fly a new spacecraft: the Boeing CST-100 Starliner during its first operational mission for NASA’s Commercial Crew Program. Williams earned a bachelor’s degree in physical science from the U.S. Naval Academy and a master of science in engineering management at Florida Institute of Technology. As a naval aviator, she logged more than 3,000 flight hours in more than 30 different aircraft. Working on the Capillary Flow Experiment (CFE), NASA astronaut Catherine (Cady) Coleman performs a Corner Flow 2 (ICF-2) test. CFE observes the flow of fluid in microgravity, in particular, capillary or wicking behavior. Coleman earned a bachelor’s degree in chemistry from Massachusetts Institute of Technology and a doctorate in polymer science and engineering from the University of Massachusetts and received a commission as a second lieutenant in the U.S. Air Force. As a participant in physiological and equipment studies for the Armstrong Aeromedical Laboratory, she set several endurance and tolerance records. Coleman logged more than 4,330 total hours in space aboard the Space Shuttle Columbia and the space station. 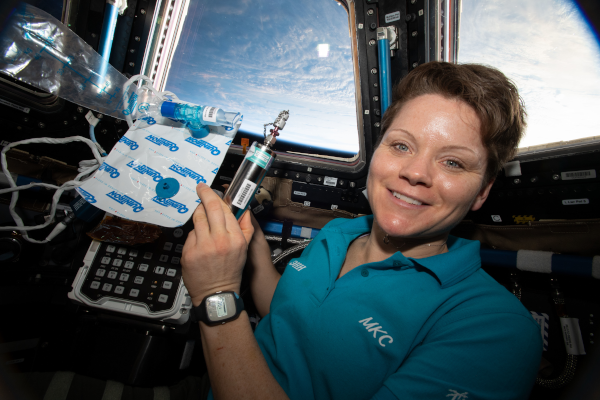 A system to purify water for use in intravenous administration of saline would make it possible to better treat ill or injured crew members on future long-duration space missions. The IVGEN investigation demonstrates hardware to provide that capability. 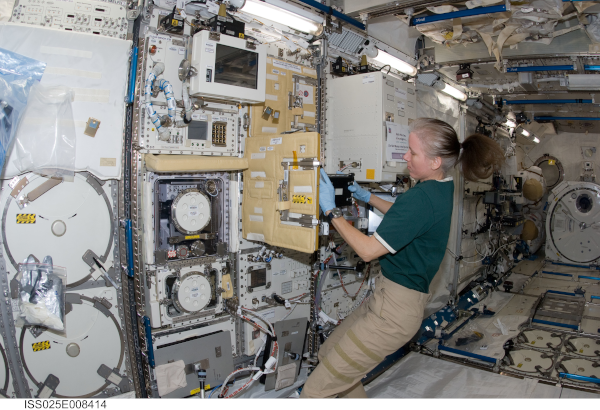 Tracy Caldwell Dyson sets up the experiment hardware in the station’s Microgravity Science Glovebox (MSG). As noted above, she and Shannon Walker were part of the first space station crew with more than one woman. She has a degree in chemistry from California State University Fullerton, where she competed in track and field, and a doctorate in chemistry from the University of California (UC) at Davis. At UC Davis, she designed and built peripheral components for a variable temperature, ultra-high vacuum scanning tunneling microscopy system. Astronaut Shannon Walker flew on Expedition 24/25, a long-duration mission that lasted 163 days. 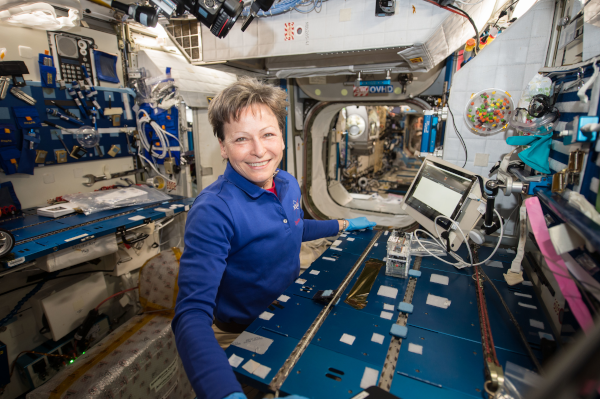 Here she works at the Cell Biology Experiment Facility (CBEF), an incubator with an artificial gravity generator used in various life science experiments, such as cultivating cells and plants on the space station. Walker has a bachelor’s degree in physics and a master of science and a doctorate in space physics from Rice University. She began working in the space station program in the area of robotics integration, worked on avionics integration and on-orbit integrated problem-solving for the space station in Russia, and served as deputy and then acting manager of the On-Orbit Engineering Office at NASA prior to selection as an astronaut candidate. 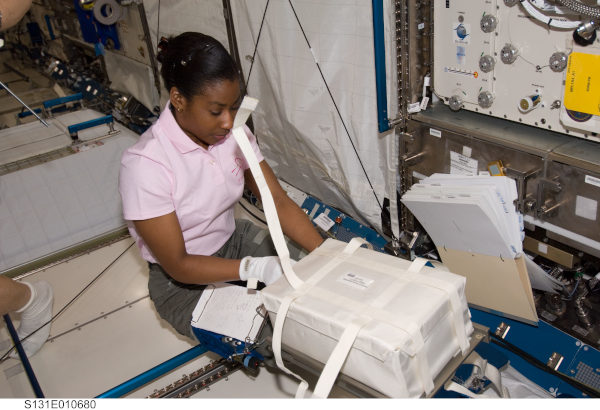 Astronaut Stephanie Wilson unpacks a Microgravity Experiment Research Locker Incubator II (MERLIN) in the Japanese Experiment Module (JEM). Part of the Cold Stowage Fleet of hardware, MERLIN provides a thermally controlled environment for scientific experiments and cold stowage for transporting samples to and from the space station. Currently serving as branch chief for crew mission support in the Astronaut Office, Wilson logged more than 42 days in space on three missions on the space shuttle, part of the Space Transportation System (STS). She earned a degree in engineering science from Harvard University and a master’s in Aerospace Engineering from the University of Texas at Austin. Wilson also served as a member of the 2009, 2013 and 2017 Astronaut Selection Boards. Learn more about the station’s history of crew members here. For daily updates on the science happening aboard the space station, follow @ISS_Research, Space Station Research and Technology News or our Facebook. For opportunities to see the space station pass over your town, check out Spot the Station.